What Should I Expect After LASIK Eye Surgery? 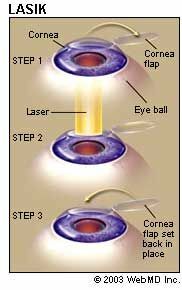 Before LASIK eye surgery, you will meet with a coordinator or eye surgeon who will discuss what to expect during and after the procedure. During this session, your medical history will be evaluated and your eyes will be fully examined. Likely initial tests include measuring corneal thickness, refraction, corneal mapping, eye pressure, and pupil dilation. Once you have gone through the initial evaluation, you will meet the surgeon, who will answer any questions you may have. Afterwards, you can schedule an appointment for the procedure. If you wear rigid gas permeable contact lenses, you should not wear them for at least three weeks before your evaluation. Other types of contact lenses shouldn't be worn for at least three days prior to the evaluation. Be sure to bring your eyeglasses to the surgeon so your prescription can be reviewed. On the day of your surgery, eat a light meal before going to the doctor and take all of your prescribed medications. Do not wear eye makeup or have any bulky accessories in your hair that will interfere with positioning your head under the laser. If you are not feeling well that morning, call the doctor's office to determine whether the procedure needs to be postponed. LASIK is performed while the patient is under local anesthesia in the form of eye drops (no shots, no needles) and usually takes about 10 minutes to complete. Patients may also request mild sedation. Plan to have someone drive you home after surgery. SOURCE: The Food and Drug Administration.